It is a beautiful 59 acre lake consisting of bass, crappie and bream fishing with 2 piers and boat access (not to exceed 17 1/2 feet in length). Mebane City residents and Orange County residents do not have to have fishing licenses if they are using live bait. All residents outside Orange County and Mebane city limits must have fishing licenses. 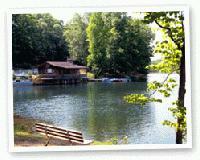 The park area is 200 acres with nature trails, picnic areas, restroom facilities, paddle boat and john boat rentals, as well as pontoon boat rides around the lake, overnight group camping, sand volleyball, special areas for tots, 3 large covered shelters and 1 small covered shelter (please make reservations). Snacks are available at the information center. Weather pending, the park is open from mid-March until the end of October. March hours are Monday - Saturday (closed Tuesday and Wednesday) from 7 a.m. to 7 p.m. (or dark), and Sunday 1 p.m. to 7 p.m. (or dark). The hours of operation between April through the end of October are Monday - Saturday (closed Tuesday and Wednesday) from 6 a.m. to 8 p.m. (or dark) and Sunday 1 p.m. to 8 p.m. (or dark). No pets or alcoholic beverages are allowed. Hours of Operation: Weather pending, the park is open from mid-March until the end of October. March hours are Monday - Saturday (closed Tuesday and Wednesday) from a.m. to 7 p.m. (or dark), and Sunday 1 p.m. to 7 p.m. 9 (or dark). The hours of operation between April through the end of October are Monday - Saturday (closed Tuesday and Wednesday) from a.m. to 8 p.m. (or dark) and Sunday 1 p.m. to 8 p.m. (or dark).